Emailed to members at the beginning of each month. Emailed to subscribers in the middle of each month. We recognize and honour the following volunteers who passed away. They will be missed. Vancouver Botanical Gardens Association remembers Ann Hotter, one of its most active, long-term volunteers and supporters. Originally from Gillingham, Kent, England, Ann moved to Canada in 1958 with a Diploma of Physiotherapy at King’s College Hospital in London and the proceeded to earn a BA in Physical Therapy from the University of Manitoba in 1968. After a lengthy career at VGH and Holy Family Hospital, where she was Director of Physiotherapy, Ann applied her considerable energy and talents to VanDusen Garden as a volunteer in many different capacities for more than 20 years. Her contributions included being a Guide, Master Gardener, Plant Sale volunteer, and loyal donor. The Association thanks Louise Dyer and Dorothy Glover for their gifts in memory of Ann. VBGA offers its condolences to Ann’s family and all her friends. She will be greatly missed and fondly remembered by the VanDusen community. Ann passed away in February 2016. With the passing of Grace McCarthy, VanDusen Botanical Garden has lost one of its greatest friends and allies. A busy young mother and a florist, she was also a popular elected Vancouver Parks Board Commissioner. In the 1960s she campaigned tirelessly for part of the abandoned Shaughnessy Golf Course to become a botanical garden, instead of being completely developed by the owners, CP’s Marathon Realty. In 1966 she was recruited to run for a seat in the Provincial Legislature and on election was immediately appointed Cabinet Minister. 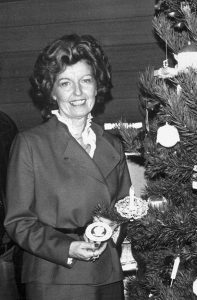 At the provincial level she was able to continue her strong fight for the funding of the botanical garden, and it was as Finance Minister in 1970 that she made the long-awaited announcement in the Legislature that the Province would put up $1M. With the City of Vancouver also providing a third of the cost, plus the parcel of land on the golf course it already owned around the Point Grey reservoir, a single anonymous donor made a donation through the Vancouver Foundation of $1M, and construction of the garden began. Over the course of her life Grace McCarthy was regularly in the Garden and continued to support many special projects and events. When her then teenage son was once asked which of his mother’s achievements made him most proud, he had no hesitation in saying ‘VanDusen Botanical Garden’. Aptly nicknamed ‘Amazing Grace’ by members of her political party, she will be sadly missed by the VanDusen community. On November 10, 2016, Vera Nixon passed away peacefully at the age of ninety-one. A graduate of the University of Toronto, Vera worked as a legal secretary before having children. She and her husband moved from Woodstock, Ontario to Vancouver to make their home here. Vera was a tireless volunteer who gave her time to the schools her children attended, Vancouver College and Little Flower Academy, and her parish. She started volunteering at VanDusen Botanical Garden in 1975 and lent her talents to the Library, Gift Shop and the Plant Sale. She was also a VBGA Board member and past President. For many years she was Captain of the Thursday Guide Team. Driving garden carts for the physically challenged brought her joy. In 2016, Vera was still volunteering as a guide and her vivacity belied her years. In fact, she led a group during the September 2016 volunteer orientation and they were captivated by her wonderful wit and depth of knowledge. Marilyn Cassady, Walter and Susan Holmes, Nan Spedding, and an anonymous donor. The VBGA thanks these donors for their thoughtful gifts. The VBGA recently lost one of its long-time supporters and volunteers, Carla Poppen, who passed away on May 30, 2017. Born in Peoria, Illinois in 1941, Carla studied political science and sociology at Knox College in Galesburg, Illinois before completing an MA in religious education at McCormick Theological Seminary. Carla emigrated to Canada after a two-year stay in Germany and completed a degree in early childhood education. This led to a varied career that including teaching elementary students and, later, financial planning. In more recent years, Carla enjoyed being a philanthropist and volunteer with community organizations as she was a long-time Member Services Desk Volunteer at the Garden. Always curious and generous, Carla and her zest for life will be missed by all. A Celebration of Life for Carla is being held on Sunday, July 30 at 2:00 pm at the Aberthau Mansion, 4397 West 2nd Avenue, Vancouver. All are welcome. On November 4, Doyne Sillery passed away after over a year-long battle with lung cancer. Born in Prince Albert, Saskatchewan, his family moved to the United Kingdom when he was five years old. After serving in the British Army, he moved back to Canada in 1956 and to Vancouver in 1957 where he met his wife Doreen. Doyne worked for the City of North Vancouver from 1958 until his retirement in 1996. He was active in square dancing, boy scouts and was a lector/special minister at his church. Doyne was a favourite volunteer with the Intergenerational Landed Learning Project at UBC Farm working with children. In 1983, Doyne became a certified Master Gardener and later took courses in horticulture at BCIT. He started at VanDusen in 2002 and joined the Friday Guides, volunteered as a Teaching Assistant, School Program Leader, in the Library, and for special events such as the Festival Lights and Plant Sale. He deftly volunteered where needed with the VBGA through the years and had a passion for nature and plants. Doyne was a mentor, a friend, surrogate parent and surrogate grandparent to many. The VBGA honours Dr. Richard Stace-Smith who provided leadership to the Association, serving as Vice President, and President (2000-2001). Richard passed away peacefully on January 17, 2017, pre-deceased by Joan, his wife of 64 years. Born in Creston, BC on May 2, 1924, Dr. Stace-Smith entered UBC in 1947 graduating with a Bachelor of Science in Agriculture and subsequently obtained a Ph.D. from Oregon State University. He worked as a plant pathologist for Agriculture Canada for 39 years until retirement, focusing on raspberry virus diseases and expanding to topics such as viruses in strawberries and potatoes. Recognized with numerous awards, Richard was granted the Order of British Columbia in 1999 for his leadership in protecting biodiversity and conserving the environment for future generations. He served in executive capacities for professional organizations such as the Canadian Phytopathological Society and edited academic journals. In addition, Richard was an Adjunct Professor in the Plant Science Department in the Faculty of Agriculture, UBC. Remembered for his productive garden that he generously shared with his Point Grey neighbours, Dr. Stace-Smith’s generosity extended to the many organizations where he made extensive volunteer contributions, including: the Vancouver Natural History Society, Brock House Society, Fraser River Coalition and the BC Naturalists’ Foundation. Richard’s love of nature and travel took him to many parts of the globe. He will be missed. June Wright, Helen Smith, Leona and Richard Converse, Alison Chilton, Brenda and Bill Miller, Anita Romaniuk, Jo Ellen Floer, Sandi Witherspoon and Daniel and Janet Phelps.